The International Marketing Council is hosting a group of US bloggers in South Africa at the moment, and taking them on a tour of some of the most interesting (and lesser-known, I think) sites across the country. 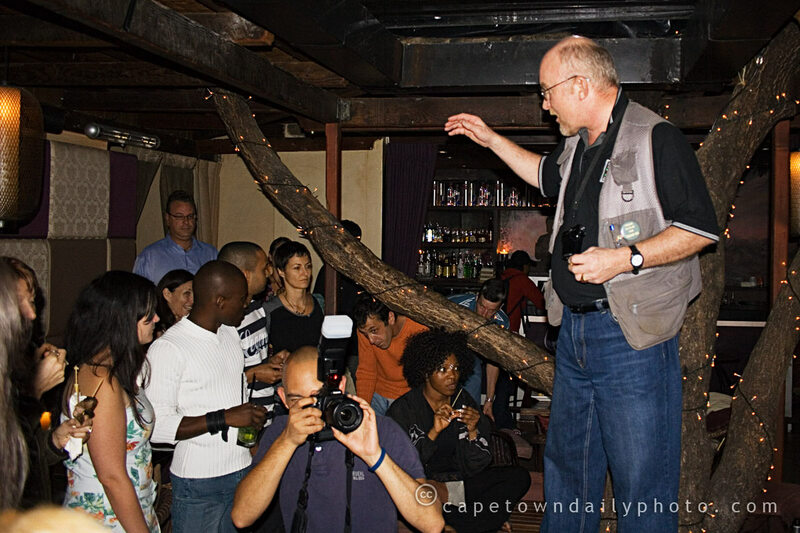 We had a chance to chat to a couple of them at a meetup event held at Asoka (the restaurant with the tree). It was great to hear their impressions and perceptions of South Africa, and I hope that they're going to have a fantastic time touring the country and learning what defines this nation. You can follow the tour on the group's website, see their photos on Flickr, and watch their videos on Zoopy. We got to speak to Ray Lewis of Down The Avenue, and Chris Morrison, who writes for Venture Beat - it was great meeting both of you, and we hope that the rest of your trip will be absolutely unforgettable! Posted in General on Sunday, 30 November, 2008 by Kerry-Anne. Isn't in frustrating when you rush to make it in time for an event, then actually manage to arrive on time, but ultimately end up being late because there just are no nearby parking spots available? I'm such a sucker for not parking illegally. My rationale is that even if I don't understand it, there must be a reason for that "no stopping" sign. Even if I had a 4x4, I'd have trouble parking on a curb or on some other unconventional spot, simply because I wouldn't want to inconvenience another driver or pedestrian (or have my car towed away). Posted in General on Saturday, 29 November, 2008 by Paul. The Liesbeek River originates in the folds of Table Mountain in the Kirstenbosch area and is home to fish, terrapins, frogs and many more creatures. 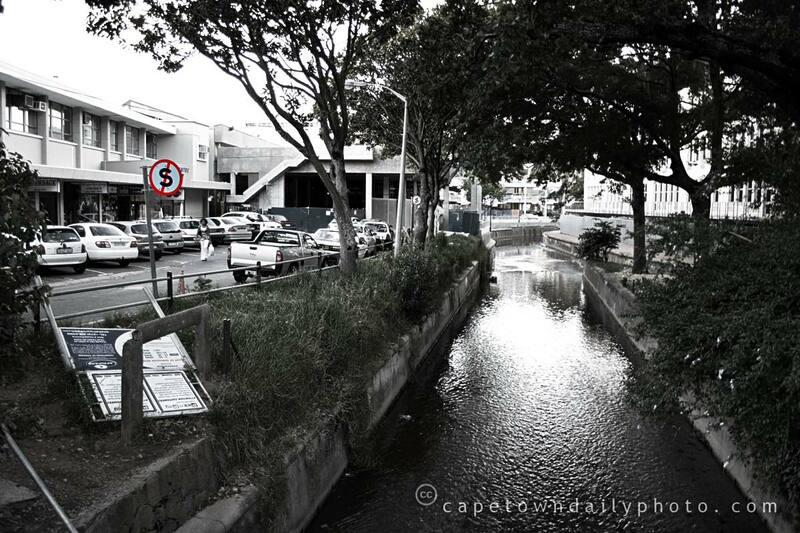 The river flows down through Newlands and Rondebosch to meet up with the Black River, which then flows through Paarden Island (an industrial area on the outskirts of the city), finally ending up in Table Bay. I managed to follow the river using Wikimapia from where it joins with the Black River and then up towards its source. In searching for information about the river I discovered a group called "Friends of the Liesbeek" - a privately run organisation involved in conservation of the river and the animals that live in it. I believe that the group raises funds and actually employs people to clean away pollution. Posted in General on Friday, 28 November, 2008 by Paul. 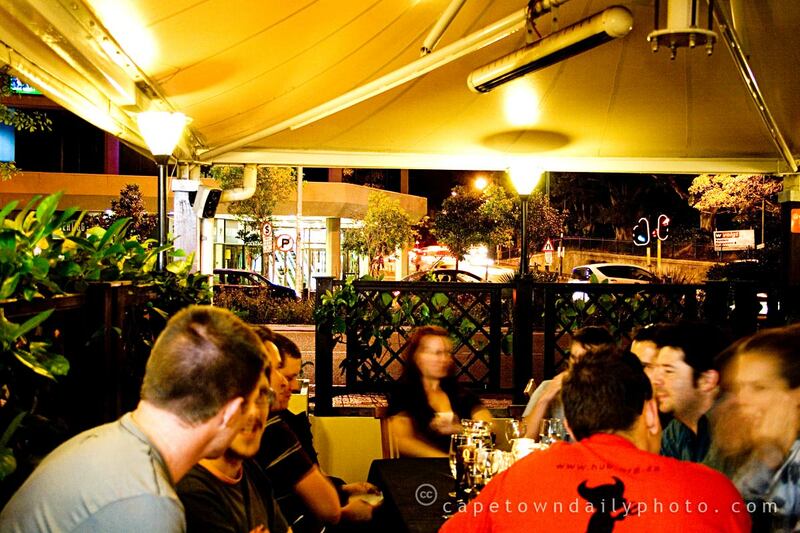 Adesso, an Italian restaurant in Rondebosch, hosted this month's GeekDinner. It's the first time in a long while that we've been to a restaurant and it's been warm enough to sit outside. Although the nearby traffic was a little noisy at times it certainly wasn't unpleasant - well not for myself, though perhaps it was a little challenging for the speakers (who were trying desperately to be heard). Thanks to Perdeberg for the wine on our tables, Adesso for the great venue and good service, and the various speakers (Jonathan, Joe, Terri Ann and Jeremy) for keeping us entertained. Posted in General on Thursday, 27 November, 2008 by Paul. 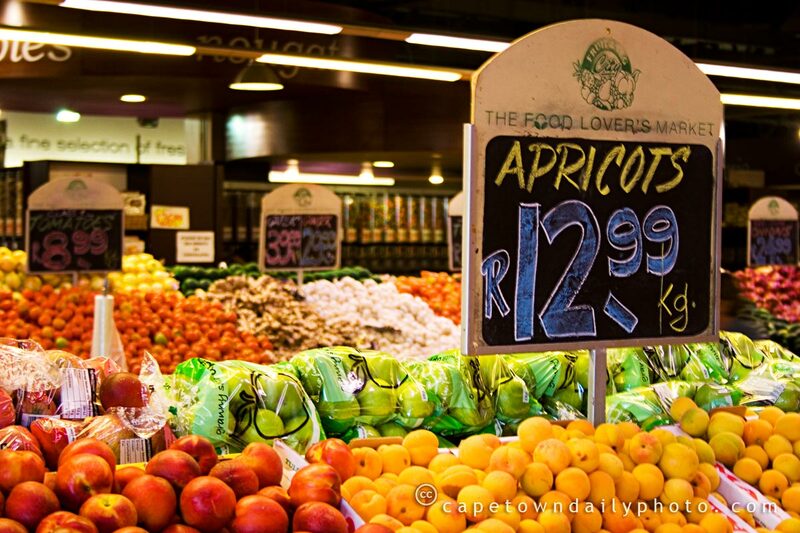 Someone commented on a previous post about this shop, mentioning that 12.99ZAR per kilogram (1.30USD, 0.85GBP, 1EUR) is very cheap for fresh apricots. This price isn't very expensive, but I wouldn't say that it's cheap either. I'm always interested to know how much food costs in different parts of the world, so if you have a moment, leave a comment and let us know what apricots cost where you live. Posted in General on Wednesday, 26 November, 2008 by Paul. If you have family far away, call them and email them often. Your clients can wait. Your family can't. I often thought of phoning my brother to chat, but was always too busy on other people's urgent work - I would give anything now to have those hours and minutes back just to laugh with him and share the day-to-day trivialities of our lives. We lose perspective very easily, as we get busy with work and deadlines and shopping and cutting the lawn and blogging and making food and watching TV and so on and so on. So make some time for the important stuff today, okay? Posted in General on Tuesday, 25 November, 2008 by Kerry-Anne. 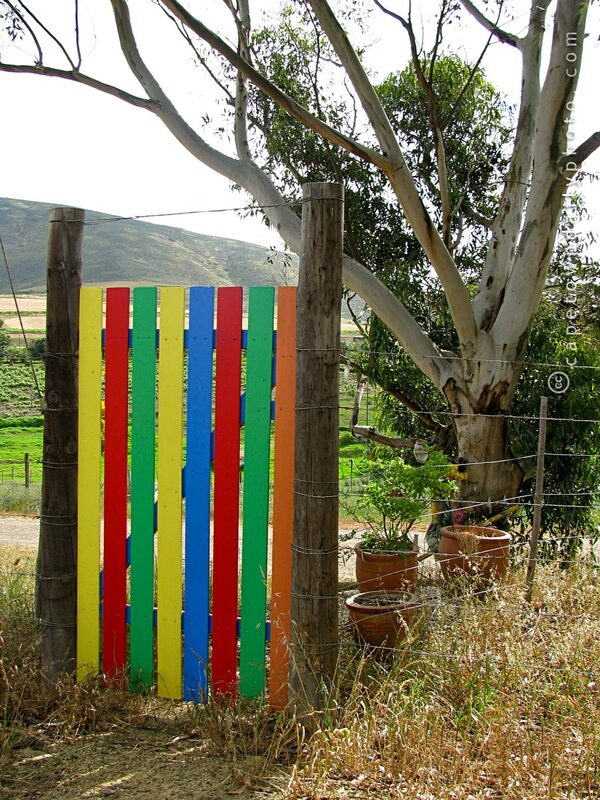 We spotted this colourful gate in the farmlands outside Durbanville. There didn't seem to be an obvious reason for its existence (on either side the fence just stretched on for hundreds of metres), and so we guessed it to be a memorial of some sort - there are flowers on the tree and in the pots behind the gate as well. I imagine that someone must have lost their life on this lonely stretch of road - a sad thought, but what a beautiful and unusual way to celebrate the life of a loved one. Posted in General on Monday, 24 November, 2008 by Kerry-Anne. 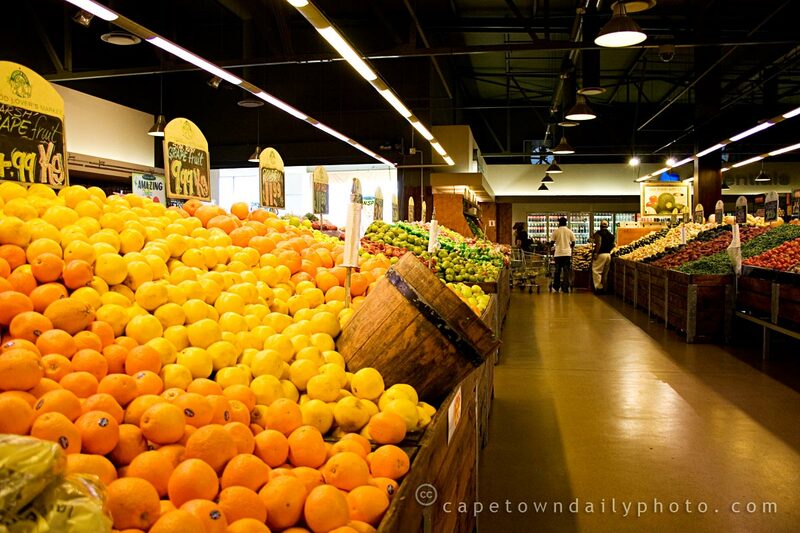 Fruit and Veg City is a chain of market-type shops that started off selling fruit and vegetables only. They've expanded in recent years to sell a variety of food and now include a butchery, bakery, delicatessen and (most important to the ladies) a chocolatier. Posted in General on Sunday, 23 November, 2008 by Paul. 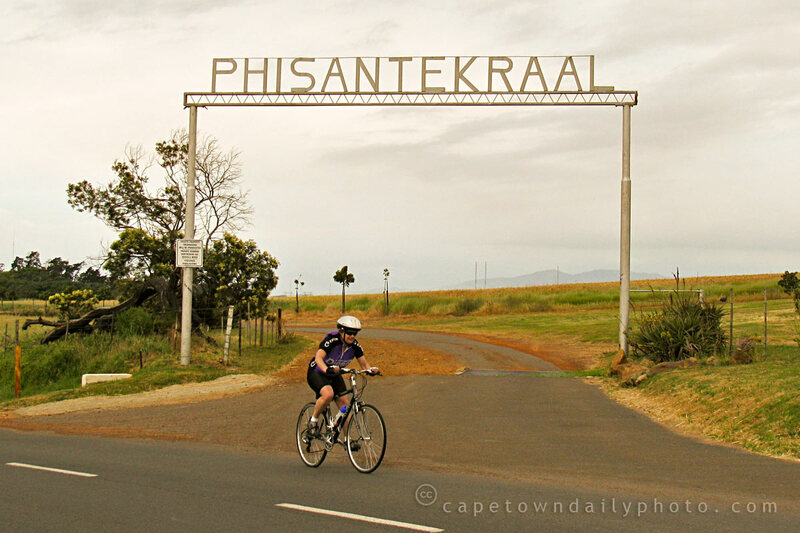 Knowing that Phisantekraal is a farm that produces Sauvignon Blanc grapes would give a clue as to how Phisantekraal is related to the Perdeberg winery. Perdeberg in fact sources its grapes from Phisantekraal. The vineyards are reportedly about 12 years old and what makes them special is the combination of Durbanville's cool morning air (just perfect for harvesting grapes) and soil, rich in oak leaves, that provides excellent drainage. Posted in General on Saturday, 22 November, 2008 by Paul. 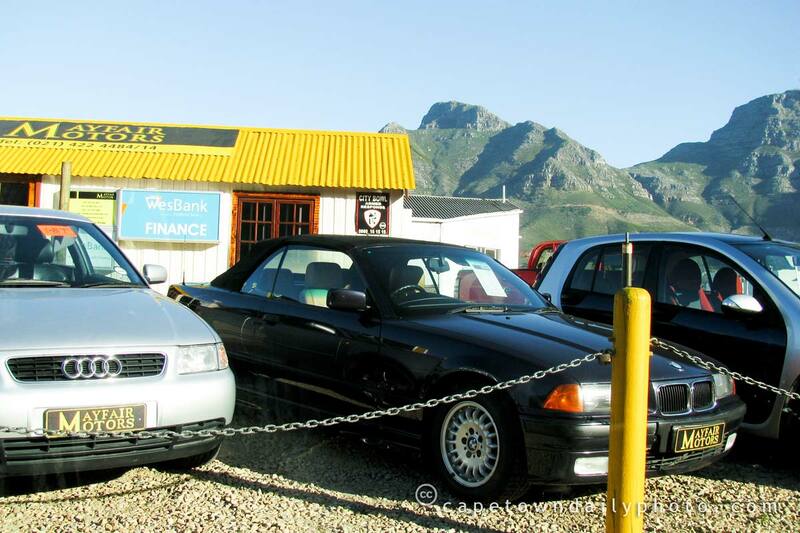 This must be the car dealership with the best view in Cape Town. I know that being a second-hand-car salesman is not the most glamorous job in the world, but I think I could sell a couple of cars now and then if it meant I could have this view every day. That's Devil's Peak in the background, by the way, and the rest of Table Mountain is off to the left. Posted in General on Friday, 21 November, 2008 by Kerry-Anne. 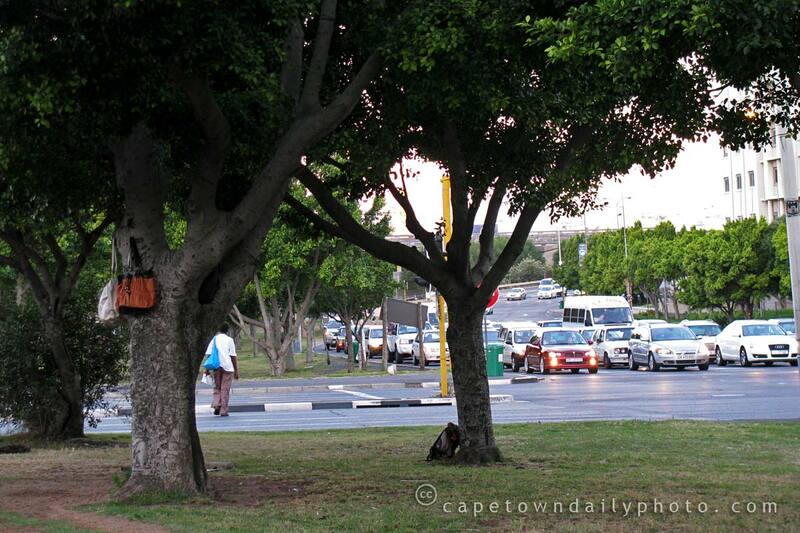 If you look closely at this picture, you'll notice some things hanging from the tree in the left foreground. Some bags, to be precise. These bags belong to the people selling the Big Issue magazine at the traffic lights. They spend hours at a time at the side of the road, peddling their publication, and this is the most convenient spot for them to store their belongings, I guess. I rather liked the idea of capturing the evidence of their presence, without actually taking a photo of the people themselves. Posted in General on Thursday, 20 November, 2008 by Kerry-Anne. I spotted this stone in the wall of a building on Buitengracht Street, and just had time to snap a photo through the window before the traffic light turned green and I had to pull away again. I did a little bit of sleuthing, and have deduced that the inscription must refer to the Mission School that was attached to St Paul's Church back in the 19th century. 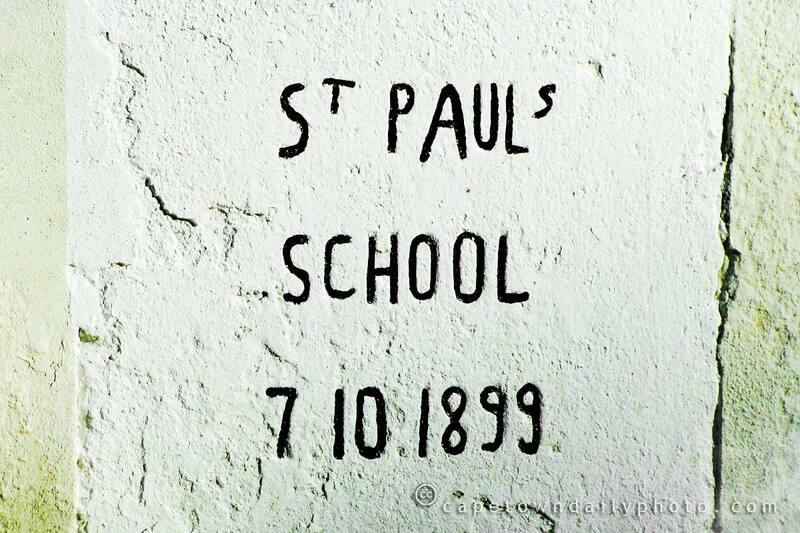 According to the website of St Paul's Anglican Church, the foundation stone of the Mission School was indeed laid in 1899. If anyone knows any more about the school, please leave us a comment. Posted in General on Wednesday, 19 November, 2008 by Kerry-Anne. 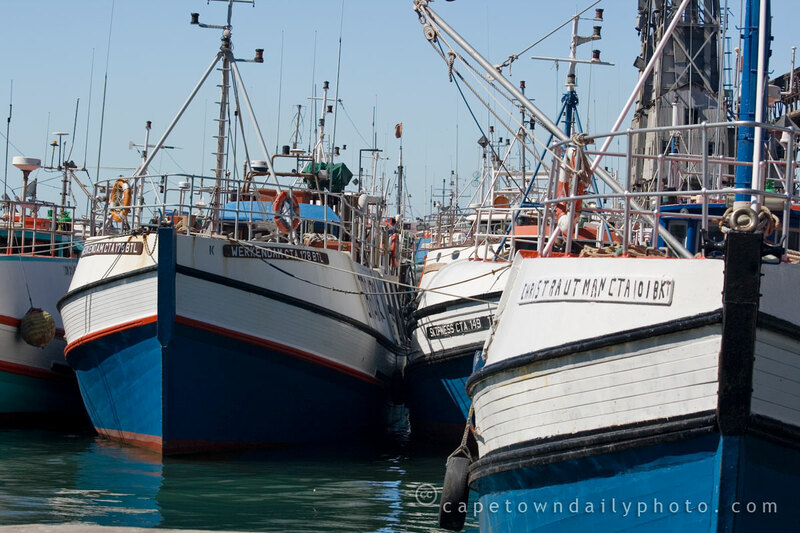 As a visitor to Cape Town, if you wanted to cast a line by yourself (without chartering a boat) then I guess it could be difficult to know where you may fish and where to purchase a fishing permit. Our government's Marine and Coastal Management website has all the information that you will need to know: where you may fish, what you may catch, how much you may take home and what the permit will cost. 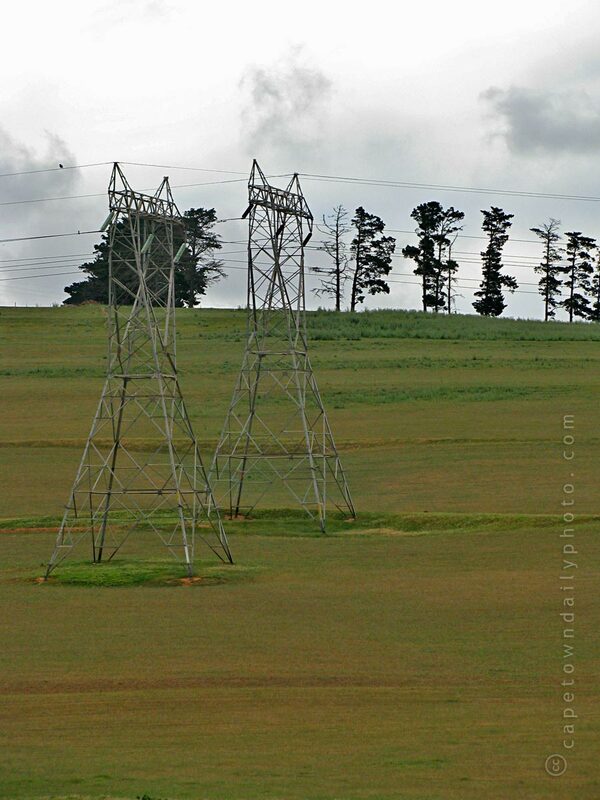 In general, licences currently cost between R40 and R70. In the past I've bought a licence from a local Post Office, but if you have any trouble figuring out what to do, don't hesitate to give the client call centre a call on +27 86 112 3626 - they'll be able to give you all the info you need. Posted in General on Tuesday, 18 November, 2008 by Paul. 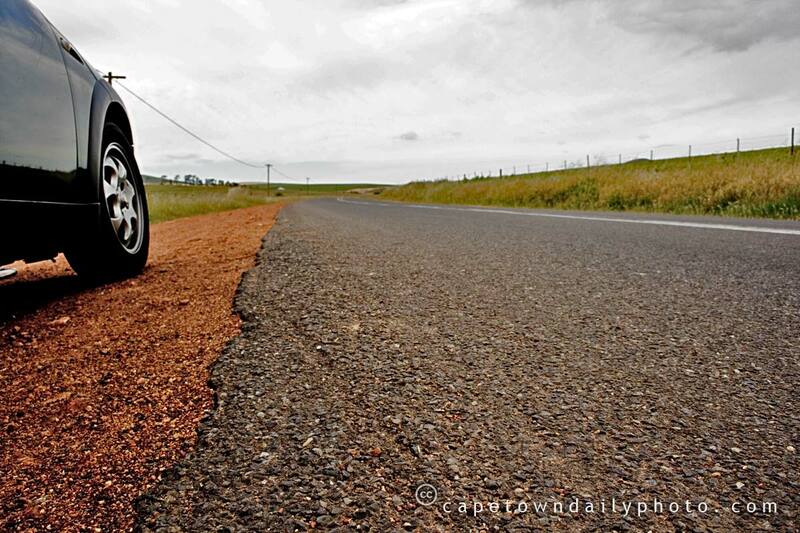 How are tyres and hay related? 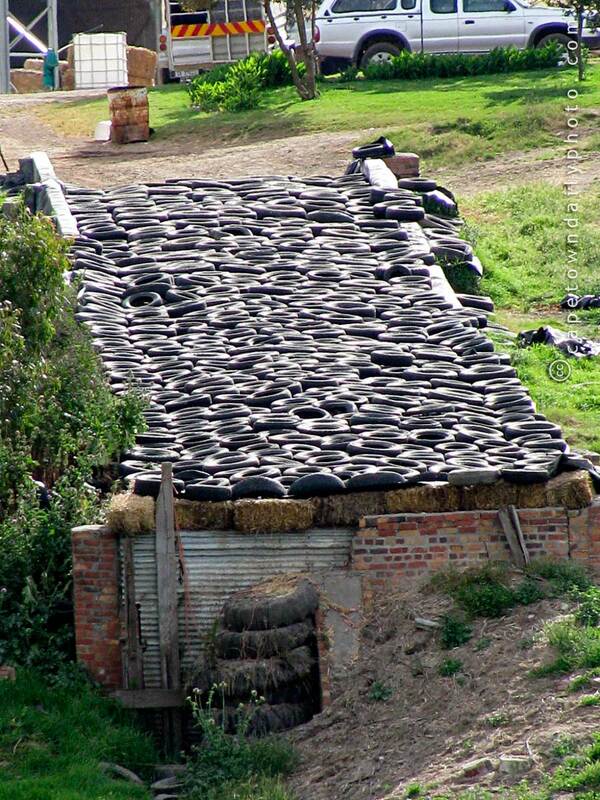 While driving in the country recently we noticed two adjacent farms using old car tyres for a purpose we're unsure of. Both farmers seemed to have laid old car tyres over bales of hay. I can only think that the brick structure in this photo is filled with hay and that the tyres are weighing the bales down so that the Cape Doctor doesn't carry them away a straw at a time. I can't understand this however - surely a net of sorts would be more effective? Please leave a comment and put us out of our misery if you know the answer. Posted in General on Monday, 17 November, 2008 by Paul. 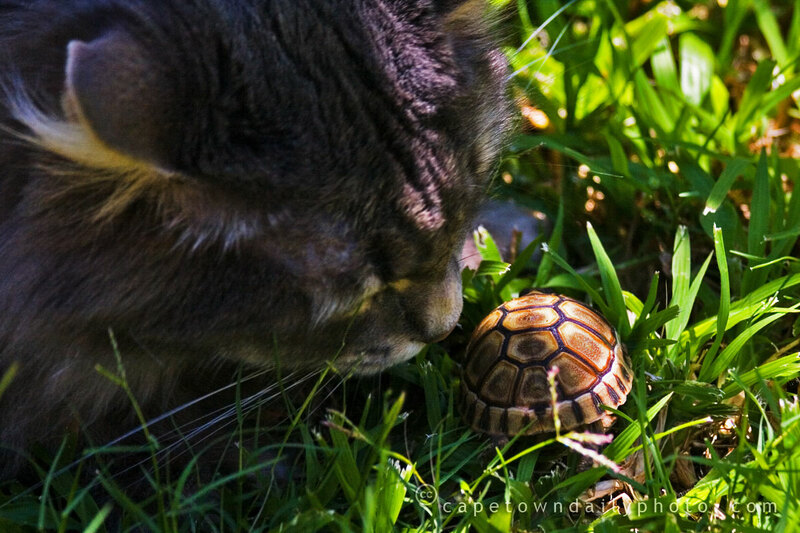 Kerry-Anne's mother spotted a little vistor, Sheldon the tortoise, hurrying about our garden. We're not sure where he came from, and needless to say, Elizabeth, the grey kitty to the left, was exceedingly curious. I'm not sure how old Sheldon is or even what kind of tortoise he is. South Africa appears to have several kinds of tortoise, like the Leopard, Tent and Angulate species. 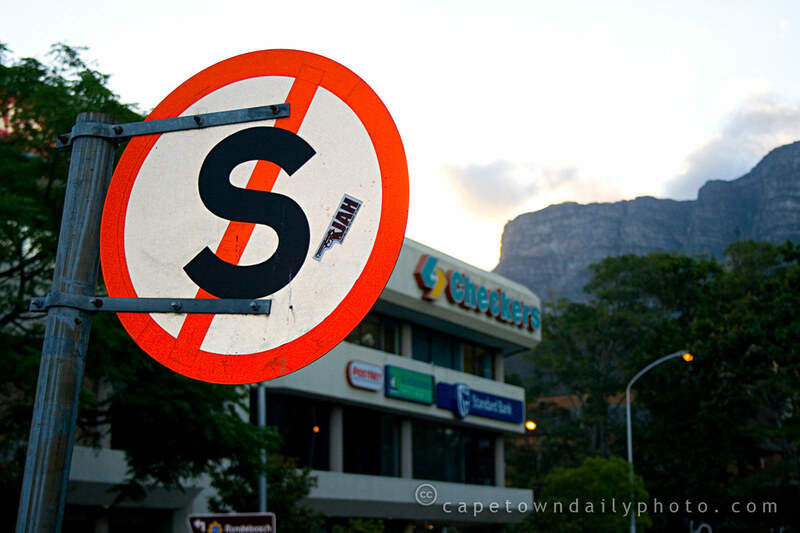 Kerry-Anne's dad told us about a large tortoise that used to roam the streets of Fishhoek. Apparently the owner had painted the tortoise's name and address on his shell so that anyone who found him could return him to his home. Incidentally, Sheldon seems to have gone missing in our garden - he's probably burrowing out a little home for himself. Don't worry, Elizabeth doesn't even dream of catching birds, so even though she was interested in little Sheldon she wouldn't think of hurting him. Chances are that Sheldon would scare her off with that big beak and those vicious front claws anyway. Thanks to Sam for suggesting the name "Sheldon" - we had a few other good suggestions, but this one kind of stuck. Posted in General on Sunday, 16 November, 2008 by Paul. My mother arranged a surprise party tonight for my dad's 70th birthday. In all the 33 years that I've known my dad I've never known him to have a birthday party, so you can imagine his surprise when he realised that my mom had arranged a party for him. 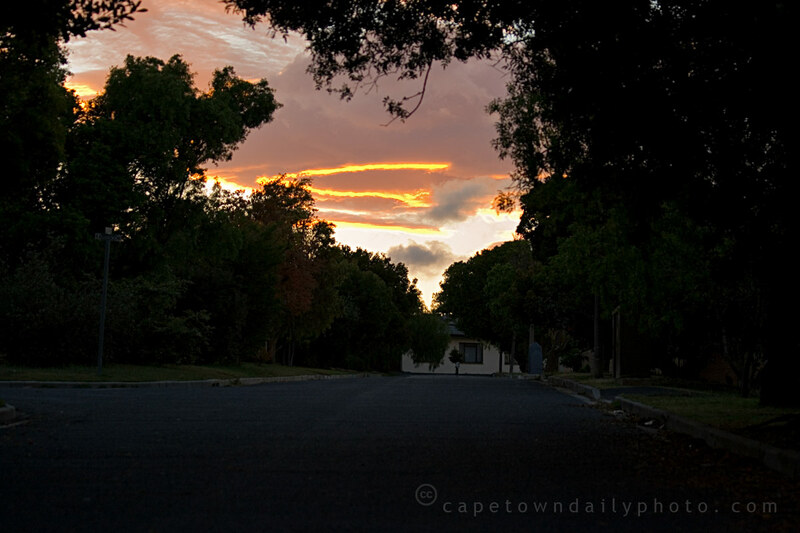 We had the party at my aunt and uncle's house on Kloof Nek, one of the most scenic parts of Cape Town. Although the sun tends to set rather early behind Table Mountain, they do have some of the best weather and the most exquisite sunrises and sunsets in all of Cape Town. 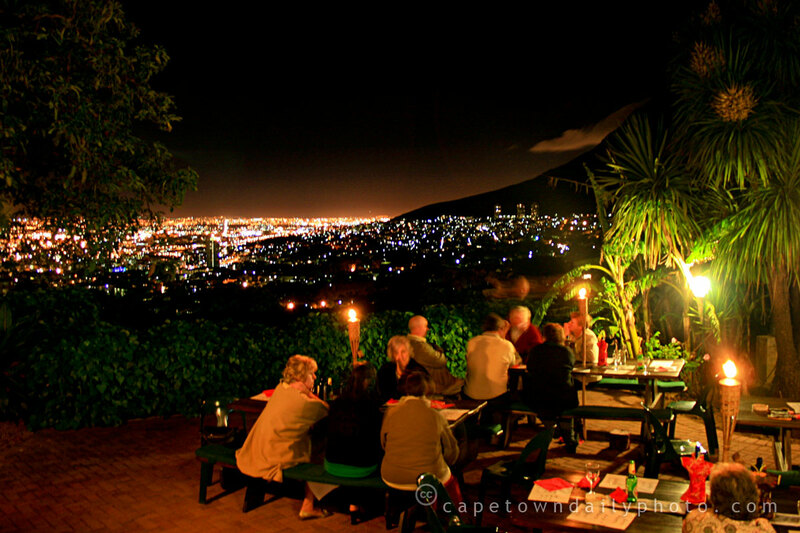 In the photo you can see the lights of the City Bowl far below and Devil's Peak rising to the right. This area really does have a unique perspective on the city. Posted in General on Saturday, 15 November, 2008 by Paul. Today the sun poked its head out after two days of rain. My brother and sister befriended Andrew, a local garden-variety lizard that was found basking in the sun at my parents' home. Andrew seems to have taken up residence at this spot, appearing ever so often to warm his cold skin. 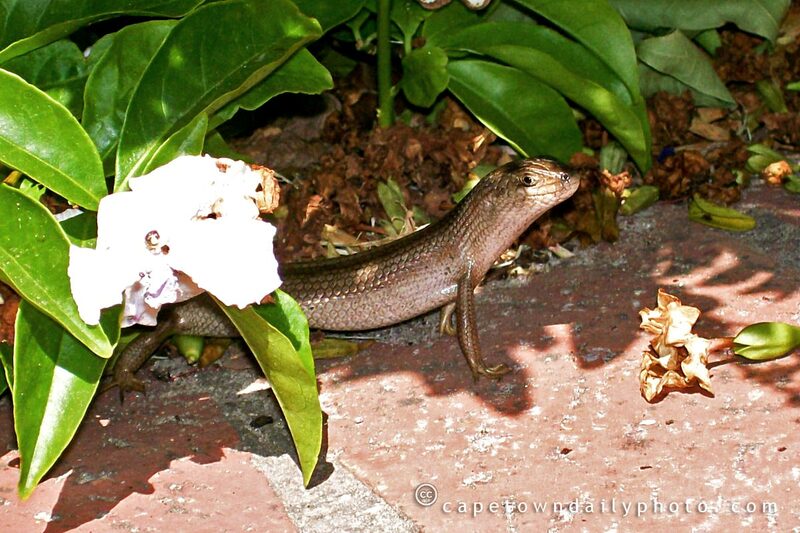 It's almost the time of the year when Capetonians and visitors start basking in the sun, much like Andrew has been doing. If you're visiting from a country with a cooler climate, like perhaps England, then be sure to use more sunscreen than you think you need. As a guideline, Kerry-Anne and I tend to use sunscreen with a sun protection factor (SPF) of at least 35 - which is the absolute minimum that I'd suggest you should use if you have a light complexion. The African sun really is as harsh as it's made out to be and each year we see fair-skinned tourists wandering about glowing red from sunburn. I often want to tap them on the shoulder to point out that they really should cover up. The difficult part is pointing this out without sounding like a parent speaking to a naughty child. Posted in General on Friday, 14 November, 2008 by Paul. After my moaning yesterday, and sending our visitor back home, ;), it would seem as though the weather may just be clearing. It rained today again, but by the time I'd arrived home this was the view from our street. Pretty sunsets after rain are generally a good sign that the rain is clearing, so I'm looking forward to a weekend of good weather. Believe it or not, in reality the sun's reflection on the clouds was actually brighter and more saturated than the photo is able to show. It really was a beautiful sunset. Posted in General on Thursday, 13 November, 2008 by Paul. Posted in General on Wednesday, 12 November, 2008 by Paul. In contrast with the graffiti that we posted on our CTDP extras blog a few months back, this "artist" has little creative skill. To be fair I doubt that this was ever intended to be a work of art, but this does make me wonder exactly why people vandalise street signs. This particular sign is at the entrance to one of the neighbourhood schools, so the chance is great that the culprit attends this particular school. Can the vandalism be simply ascribed to boredom? Is the act perhaps intended to impress friends, or a potential girlfriend? 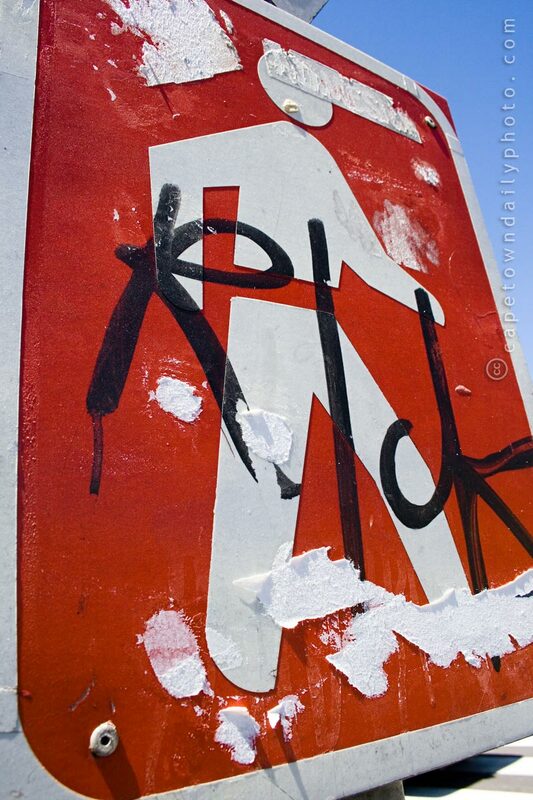 It's easy for adults to shake their heads in disapproving dismay at the destructiveness of "our youth", but I guess on reflection one might rather be dismayed at the destructiveness of people - after all, some vandalise road signs, others vandalise countries. Which is the greater evil? Posted in General on Tuesday, 11 November, 2008 by Paul. As I mentioned in yesterday's post, we discovered one of Stellenbosch's gems over the weekend - the Stellenbosch Botanical Gardens. The garden is supported by the University of Stellenbosch, and whilst it's the perfect place for students to relax and have an afternoon nap under the trees, it's also used to assist with the practical training of botanists as well as research into the field of botany. Posted in General on Monday, 10 November, 2008 by Paul. 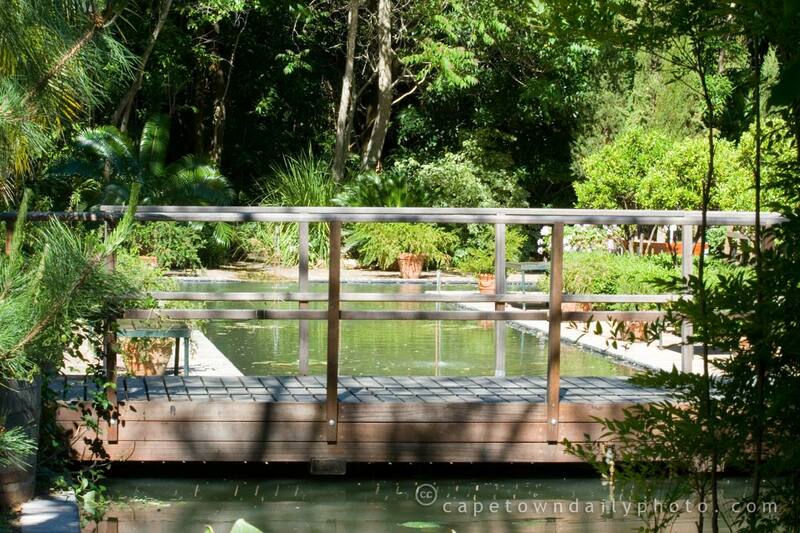 Each year estates in and around the farmlands of Elgin open their exquisite gardens for viewing to the public. Visitors spend the day, and sometimes the weekend visiting estate after estate, enjoying tea and light lunches in the midst of some of the most beautiful scenes Nature has to offer. This year we missed out, though. Amongst others, Kerry-Anne desperately wanted to visit "The Secret Garden". Alas, it was not to be, and as a small consolation we headed off to Stellenbosch for an hour or so just to make her feel better about missing out on the annual visit to Elgin's gardens. Neither of us were aware that Stellenbosch had a botanical garden, and this small consolation turned out to be a gem of a discovery. 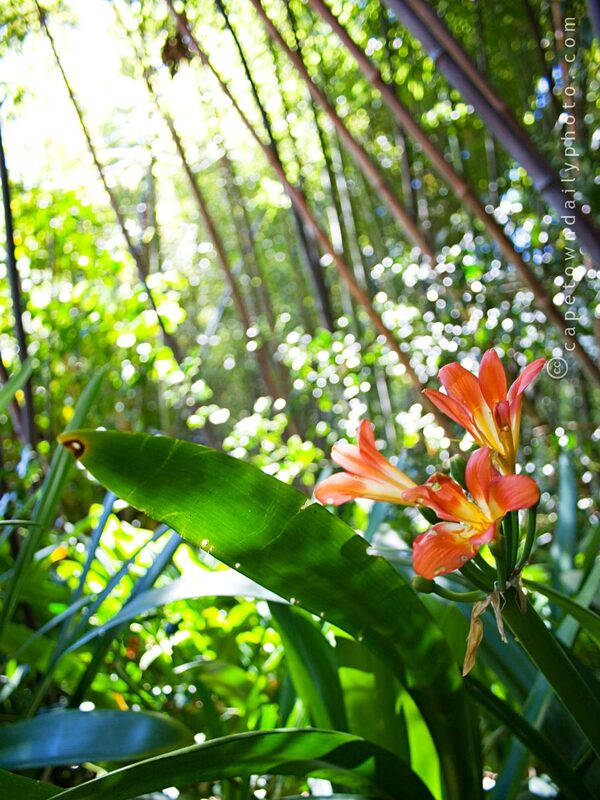 Stellenbosch Botanical Gardens are significantly smaller, but easily rival the well-known Kirstenbosch Botanical Gardens in their beauty. After having a drink and some cake at the restaurant we spent a short while walking through the gardens. We'll definitely have to spend a couple of hours there soon - in fact I believe Kerry-Anne's making plans to try and visit after her exam on Friday. Posted in General on Sunday, 9 November, 2008 by Paul. In preparation for our national elections next year, the Electoral Commission has designated this weekend as Voter Registration Weekend. We've moved house and voting district since our last round of elections, so Kerry-Anne and I popped in at Stellenberg High School today to update our details. The registration process was painless and simple. There were no queues and we walked in, filled in a 1-page form, had our ID books scanned and voila, we were out of there in under 5 minutes. 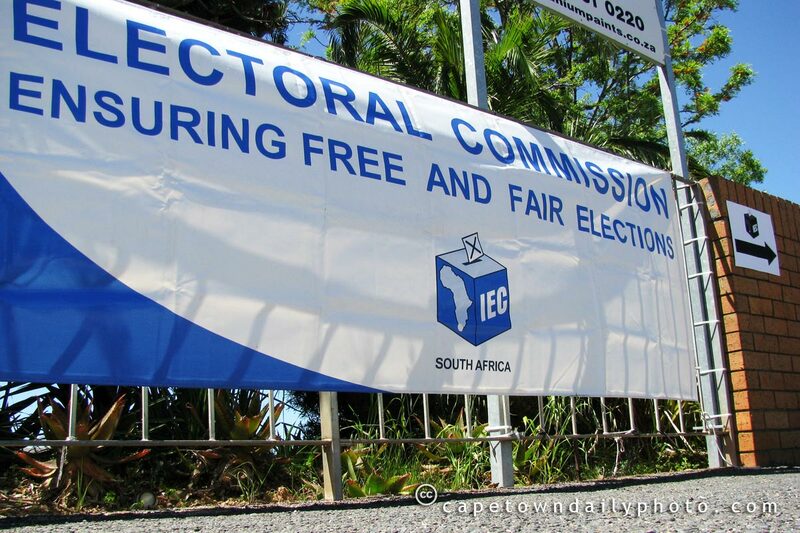 If you've moved since the last round of elections, or if you have never registered to vote, be sure to visit your local IEC registration station on Sunday. If you're not registered, you won't be able to vote, and with these elections gearing up to be very interesting indeed, you should consider it a civic duty to vote, rather than merely a right. Visit the IEC elections website if you're not sure in which district you live or where your voting station is. Unfortunately the site only works in Internet Explorer... so if you're a Mac, BSD, Linux, etc. user then you're going to have to wander the streets trying to find that darn IEC poster. Posted in General on Saturday, 8 November, 2008 by Paul. They may mark a burial site, and may memorialise the dead. They may mark the summit of a mountain. Placed at regular intervals, they indicate a path across stony or barren terrain or across glaciers. The Inuit erect human-shaped cairns, or inuksuit as milestones or directional markers in the Canadian Arctic. In North America, cairns may mark buffalo jumps or "drive lanes". In North America, cairns may be used for astronomy. In the Canadian Maritimes cairns were used as lighthouse-like holders for fires that guided boats, as in the novel The Shipping News. In parks exhibiting fantastic rock formations, such as the Grand Canyon, tourists often construct simple cairns in reverence of the larger counterparts. They may be used to commemorate events: anything from a battle site, to the place where a cart tipped over. Some are merely places where farmers have collected stones removed from a field. 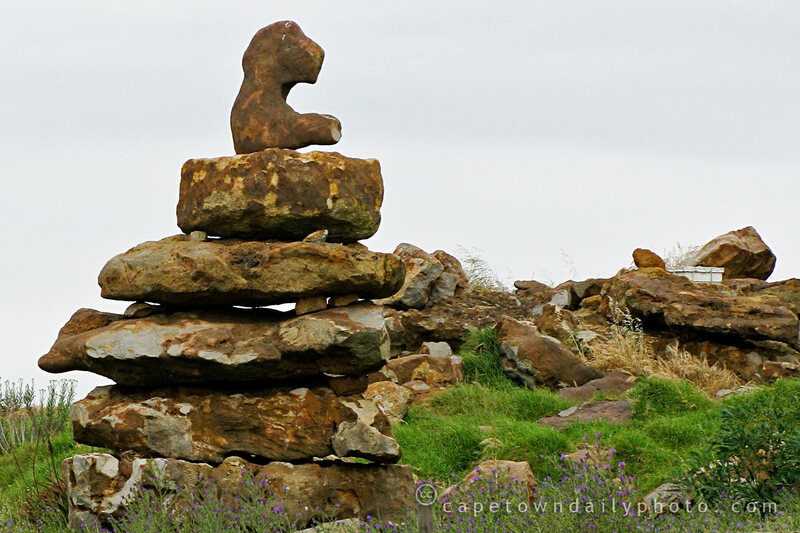 When hiking on and around Table Mountain you'll be sure to find a few cairns. We spotted this particular cairn in the middle of farmlands, and judging by the size of the individual rocks, it must have taken quite some effort to build it. Posted in General on Friday, 7 November, 2008 by Paul. Gerhard Pieterse, Executive Director of Autism Western Cape built a jail cell, had it erected in a local shopping mall, and then presented himself to police officers asking to be arrested. Gerhard was fingerprinted, formally cuffed and transported in the back of a police van to the purpose-built Bayside (and later Canal Walk) shopping mall jail cells. Gerhard spent a total of 74 days and nights in his shopping centre cell watching, being watched by, and interacting with shoppers. Gerhard's aim was to increase awareness about autism as well as to raise 1 million rand to help people with this disorder. For those who don't know, autism is a neurological disorder which results in sufferers having impaired social interaction and communication skills. You may recall the movie Forrest Gump or perhaps Rain Man in which lead actors portrayed autistic characteristics. While the disorder is a complex one the people affected are certainly not stupid or unintelligent. From a layman's perspective, they are simply unable to relate socially. Gerhard spent 74 days and nights in his cell and with support from friends and family raised just over R600 000, which will be put to great use in establishing schools and facilities to help people with this disorder. 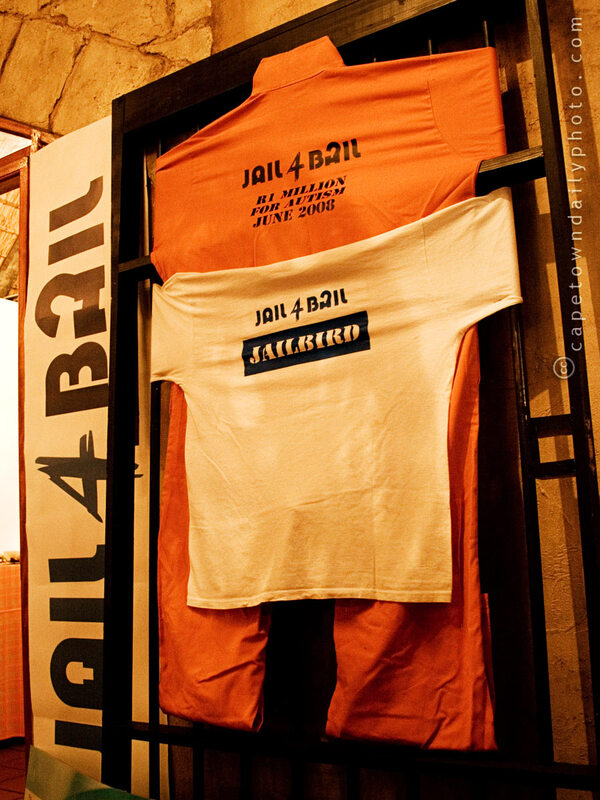 You're still able to donate to the Jail4Bail cause and I'd encourage you to visit their website to read a little more about the organisation, perhaps donate money, or even discover an alternative way in which you could assist them. Posted in General on Thursday, 6 November, 2008 by Paul. South African Convention Movement, Barack Obama, what’s next? It's been a political week for South Africa and the USA alike. Aside from yesterday's US elections, on Saturday Mosiuoa Lekota, our ex-Minister of Defence, announced the formation of a new political party, arguably the only party with a real ability to topple the ruling ANC's supremacy. The formation of this new party could be the best thing for our democracy, and if Lekota is to be believed, its roots are fixed in strengthening our economy, building a nation free from the past, upholding our constitution, and keeping the values held dear by our beloved former president Nelson Mandela. Posted in General on Wednesday, 5 November, 2008 by Paul. Today's post is dedicated to all our American readers (who, if Google Analytics is to be believed, make up roughly half of the visitors to our blog). So if you haven't already, do go and cast your vote, and help make a little bit of history. Posted in General on Tuesday, 4 November, 2008 by Kerry-Anne. 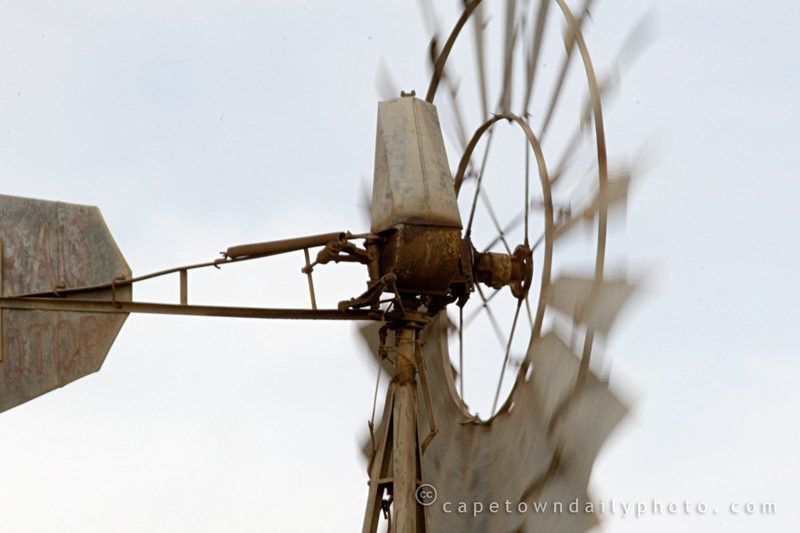 There I was, out on the gravel road leading to Fair Cape dairies, taking photos of a windpomp (pronounced something like vind-pawmp, directly translated as wind-pump) when I heard this bakkie (pronounced buck-key) approaching quickly from behind. Considering the amount of dust being thrown up into the air I grabbed my camera, ducked into the car and snapped this shot from a point of safety. The signpost reading "stadig, stof op koring" clearly didn't mean much to the driver. 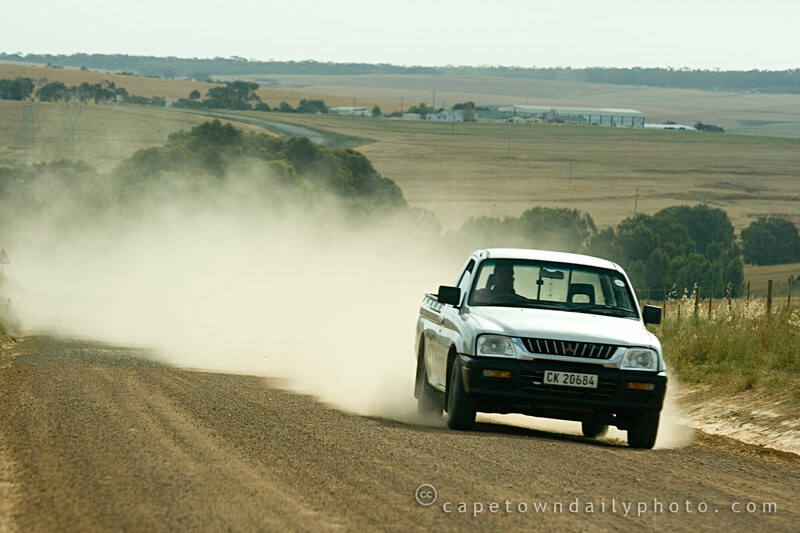 At the risk of this post sounding like a lesson in Afrikaans, "stadig, stof op koring" means that we should drive slowly (stadig) because the dust (stof) thrown up by vehicles settles on the wheat (koring). Posted in General on Monday, 3 November, 2008 by Paul. I usually suffer from fairly severe hayfever in springtime, but for some reason this year I've barely been affected at all. A few sneezes here and there, but nothing like in the past. The strange thing is that apparently it's quite a bad hayfever season this year, and I've heard plenty of people complaining of pretty severe symptoms. 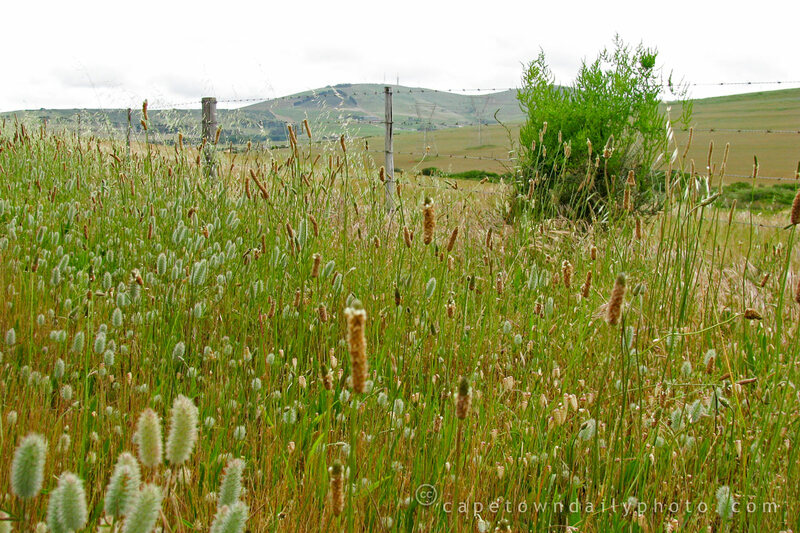 Of course, ducking down among these grasses to take a photo was not a good idea, particularly in Cape Town's November wind; and I spent the rest of our drive around Durbanville trying to rub my very itchy eyes without destroying my contact lenses. In fact, my eyes are getting itchy right now just thinking about it. I'm sure other hayfever sufferers can relate. Posted in General on Sunday, 2 November, 2008 by Kerry-Anne. 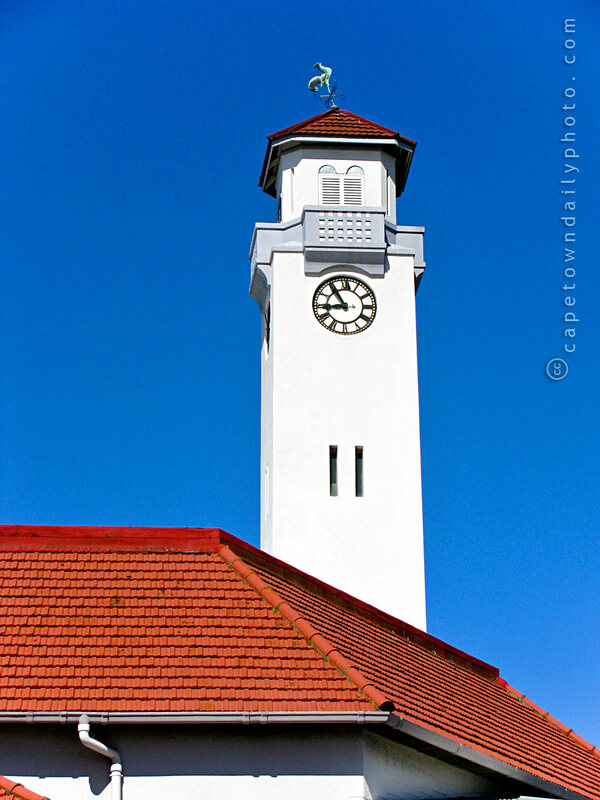 We took a drive out along the Malanshoogte Road from Durbanville late this afternoon, and stopped every so often along the way to take photos. 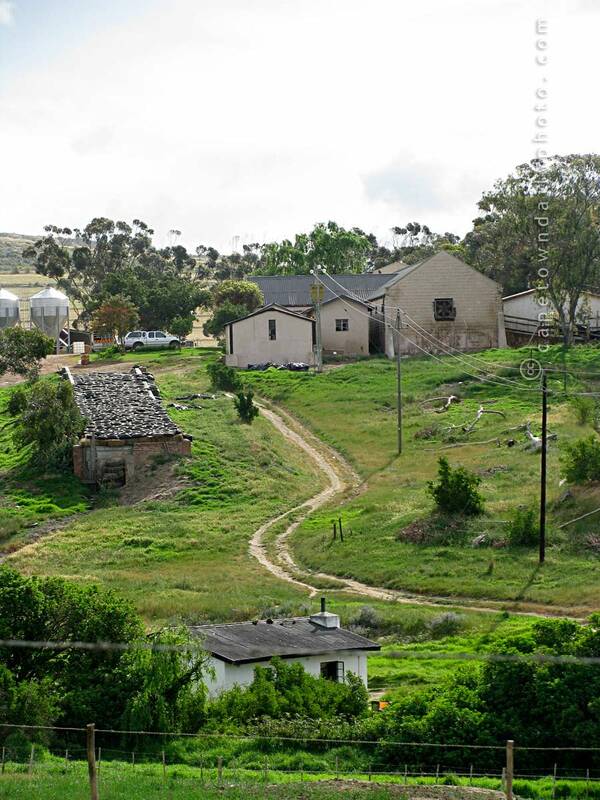 The farms surrounding Durbanville are home to a fair number of sheep and cows, and even a few ostriches; and the lands are filled primarily with wheat and vines. It's an astonishingly rural area, given that it's just a few minutes away from the centre of the town. Posted in General on Saturday, 1 November, 2008 by Kerry-Anne.